Sonja Yelich lives in Bayswater/Devonport, Auckland. 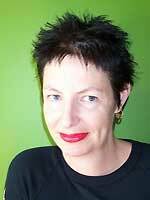 She has published her work in literary journals for many years and has studied creative writing under Witi Ihimaera. AUP New Poets 2 (AUP, 2002) is her first book. These poems piece together colourful pictures of a New Zealand childhood haunted by a harsh European past and she adds to the mix the voices and dramas of her own children in contemporary Auckland. Sonja likes to twist and turn words in much the same way as she heard them spoken as a second language, and always with the sea somewhere in the back of her mind. She says dialogue, when going between one language and another, can make a whole new tongue for which there is no dictionary. Her four small children are beginning to provide her with yet another language, another way of talking, a new set of accents, where everything has a meaning but is sometimes lost in translation. Things have come full circle. At the zoo my mother is from 1972. Our TV is black & white with knobs. The school bander prints in violet ink. We have a v dub BJ1476. My mother is 26 no more. My pigtails are in rubberbands. I wanted plaits but never got them. We were somewhere by the polar bears. icicles which drip concrete icicles. which was an adventurous buy for my parents. in its whole whole life.